When Rick* and his wife Lisa checked the voicemail, there was nothing, only silence. Rick thought nothing of it, until getting a phone call later from his father-in-law. He said to Lisa, “I want you to talk to your mother.” Her mother had slurred speech, and she had no idea what day it was. They rushed over, and took Lisa’s mother to the ER. The tentative diagnosis was that she’d had a stroke. While she recovered, Rick and Lisa took it upon themselves to clean up their parents’ home. They found evidence of sizable hoarding. A couch covered with junkmail. Stacks of VHS tapes. Empty bottles, magazines dating back to the year 2000. There was a certain kind of crazy-quilt logic to the organization of the detritus. Rick was just happy that the stacks of junk only reached three-and-a-half feet high. The cleaning project was daunting, and not just from a physical perspective. Lisa recognized hoarding tendencies within the family. Was this her eventual fate? Due to a mysterious genetic alchemy, would she recede into her twilight years in a home jammed full of junk? Would she be found surrounded by mountains of trash as Fox News blared from a distant television somewhere in the house? With the high-profile suicides this week of Kate Spade and Anthony Bourdain, there’s been renewed talk about mental health. Inside that conversation are questions about conditions passed down by genes. Sometimes, the Venn Diagram of reality and entertainment intersect, and a movie is released at a moment that’s simply uncanny. 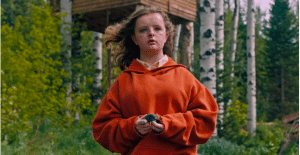 I’m not sure I’d say Hereditary is the “right” movie, as such, but it captures those particular anxieties with nightmarish power. We’re introduced to Annie (Toni Collette), an artist who specializes in miniature dioramas that portray her past and her family. Her mother has just died. Their relationship was…well, let’s go with strained. Strained seems to be the overriding theme within her family. Her husband Steve (Gabriel Byrne) is a natural peacemaker, and almost completely ineffectual. He tries to comfort her. She lies, tells him she’s going to the movies, and instead heads to the basement of a church and a grief support group. This might be helpful if she wasn’t totally uncomfortable with displays of emotion, yet emotion seeps out of her like an awakening volcano. The kids are not much better, I’m sorry to say. Their teenaged son Peter drifts through high school on a combination of sadness and weed. His younger sister Charlie? Hoo-boy. She wanders through the wooded area surrounding the house barefoot, constantly sleeps in a treehouse, and cuts the head off a dead bird in order to draw it. I’m all for artistic expression, but Charlie steamrollers over the line. The family positively vibrates with tension. Do they love each other? Well, they seem to think so, but they’re a group of strong-willed people who can’t openly share and deal with their emotions, and they take passive-aggressive behavior to impressive heights. On top of all this psychodrama, there’s a feeling that something is watching them and waiting. From there…? Aster also wrote the screenplay, and he’s just as interested in delving into the cracked dynamic of the family as he is in cranking up the tension. He gives the movie lots of time to breathe so that we can get to know them. Even smarter, Aster knows how trauma can realistically seep into a person, and how it can cause people to lash out at each other, retreat to bed, or explode. This is one of the most violent films I’ve ever seen, and while it has its share of horrific imagery, it’s more due to intense emotional violence. Since Aster knew exactly what kind of movie he was making, his cast did as well and delivered outstanding performances. Gabriel Byrne’s useless compassion is sad, and I hadn’t realized until now how much I missed seeing him in high profile movies. Character actor Ann Dowd is heartbreaking as Joan, Annie’s friend from the grief support group. Toni Collette is the undisputed MVP here, and it’s no real surprise. She’s been acting for over two decades, and she’s so consistently good that I think people take her for granted. As Annie, her performance is astonishing. She whipsaws between brittle control, desperate love, and full hysteria. She goes through the cycle of grief believably, and when things start to get really bad, her responses are simultaneously huge and honest. This is one of the best performances of the year. 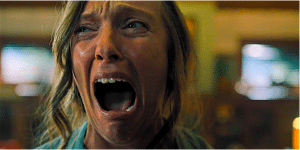 The last half hour of Hereditary is a nightmare, and some may think the ending comes out of nowhere. That’s not the case, as the impeccable craftsmanship of the film provides us with pieces that feel unrelated until we finally see the entire puzzle. 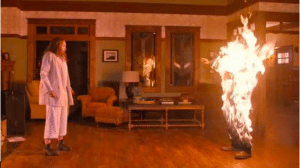 As alarming as the movie’s supernatural aspects are, the real horror comes from the fear that no matter what you do, you can’t escape your genes. *My friend “Rick” agreed to let me write about this experience, with the understanding that I wouldn’t use real names. Fine, but he originally wanted to be referred to as an “unnamed source.” Not gonna happen, Rick! **I saw this film in a theater mostly filled with teens and couples in their early 20’s, looking for some scary Friday night fun. They had no idea what they were walking into. ***You can read more about Stetson’s process here.